After a slightly later, but still expensive hotel breakfast, we headed out to the airport and remarkably found our way with only one minor miss-turn that resulted in a few dirty looks from fellow drivers and we lost Hubie as a result. However, we all made it to the airport safely and found Hanspeter from Switzerland flying in the box, but with only a 1000’ broken cloud base, it was a challenge for him. He came down and we waited about 30 minutes before the practice list was made and the rotation started, flying between the clouds and eventually the clouds gave way to a beautiful clear sky. The airport is getting many noise complaints, but the staff is dealing with it as they want us here. The people around here are not used to this and will soon be praying for rain I’m afraid. We did attract quite the crowd at the airport as well, all friendly and eager to know what we were doing. Today I asked Brendon, one of the airport officials, about the letters “L” and “P” I have seen on some cars here. I also noticed these large letters available for sale in gas stations. Apparently the “L” goes on the back of the car for people who are learning to drive. I immediately said we needed three of these for Norm, Debby and Hubie’s cars. Then I learn the “P” is for those who just passed their drivers test and it is required for two months. Goody thought we should have one of these as well. We convoyed home again today but a slight misstep by Debby resulted in Norm being passed by Hubie and us having to find our own way home. Robert arrived this afternoon and Len (the team mechanic) will arrive around midnight tonight. My internal GPS actually worked and we actually made it from the airport and to the hotel with no detours. A great team dinner was had and there is more in store for tomorrow no doubt. 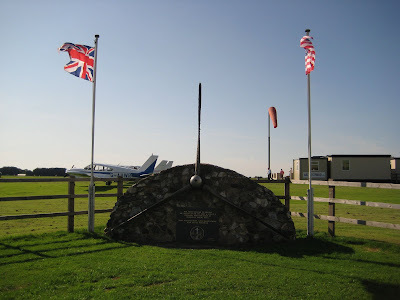 Lastly, here are two photos from a monument just across the grass from the FBO. It is a tribute to the Navy pilots who flew from here and were the anti-submarine force. 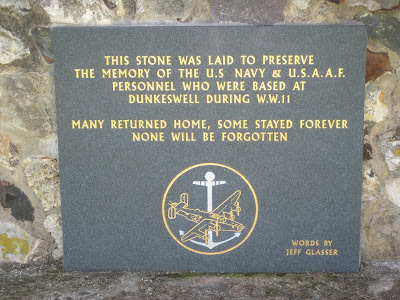 This was quite an important airport in WWII. One just north (I think) of here didn’t fare so well and is closed an deteriorating, as are many in England.